No two people are quite the same – and with the amount of data it has on everyone, no one knows that better than Google. 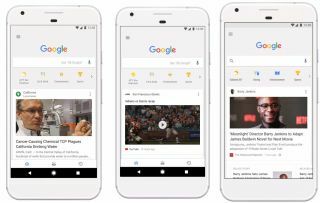 In recognition of that, Google has created a new Feed experience in the Google app that uses machine learning to offer content more acutely tailored to you and your interests. The Feed initially rolled out back in July for the US, but now it’s available globally across several languages. Appearing as a tab in the Google app, the Feed will offer you a 'glanceable', feature-rich feed of trending news in your area, stories related to your interests and updates on your favorite movies, sports teams and musicians. How does Google make sure what it shows will be of interest to you? Using a combination of what’s trending close to your location and your previous interactions with the search engine, Google is able to decide what it should show you. Thanks to its machine learning algorithms, the more you use Google the more accurate your feed is likely to be. According to Google, “as the world and your interests change, your feed will continue to grow and evolve along with you.” For example, if you’re deeply interested in one topic and only casually interested in another, your feed will reflect this. If Google gets something completely wrong, though, it’s possible to unfollow topics completely by tapping its card within your feed. To make it easy for you to choose what appears for yourself, Google has made it possible to follow your search results. So, if you use Google to search for a TV show on your phone, you’ll see a ‘Follow’ button appear. Selecting this button will mean stories and content related to this TV show will immediately start appearing in your feed. Newsfeeds tailored to our interests have often been criticized for creating an echo chamber effect where we don’t hear anything that doesn’t fit neatly with our view of the world. In light of that, Google has said that the news stories it presents to you in the feed will come from a range of sources which will offer a diverse range of viewpoints and perspectives. This, it says, will allow you to fact check what you’re reading and form a more “holistic” understanding of what you’re interested in. At the moment you’ll only find Google more personal feed in the Google app on Android devices, but it’ll be coming to iOS versions of the app and the Google homepage on mobile web.